Men's Wearhouse faces a proxy fight from its largest shareholder after it rebuffed a hostile bid for the company from rival Jos. A. Bank. Jos. A. Bank Clothiers on Friday dropped its hostile bid for larger rival Men's Wearhouse. The decision prompted Men's Wearhouse's largest shareholder to launch a proxy fight to try to remove its directors and force a deal. Eminence Capital, which owns 9.8% of Men's Wearhouse shares, said it wants a special meeting of the company's shareholders to vote on possible removal of the company's directors. It said Texas law, under which Men's Wearhouse is incorporated, permits special meetings to be called by holders of at least 10% of all shares. "We continue to encourage the board to take immediate steps to complete its review of strategic options, including a merger with Jos. A Bank," said a statement from Eminence. "If the Board fails to do so, our special meeting initiative will give shareholders the tools to hold the board accountable for its failed leadership." A spokesman for Men's Wearhouse did not respond to a request for comment on the filing. Shares of Men's Wearhouse (MW) were little changed in early trading. Men's Wearhouse enacted defenses against hostile bids when Jos. A Bank launched its unsolicited $2.4 billion cash bid for the company. Eminence said that it is also opposed to those defenses, which allow current Men's Wearhouse shareholders to purchase more stock at a discounted price if a bid for the company was not accepted by the board, making the company less attractive to potential bidders. Jos. 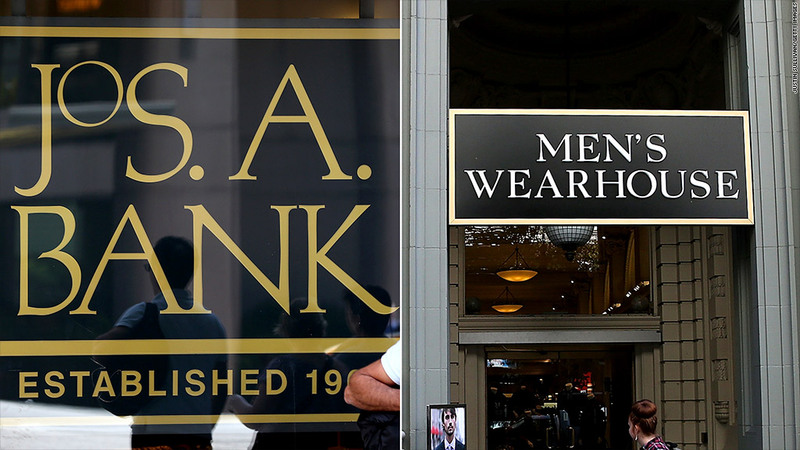 A Bank (JOSB) had given Men's Wearhouse until Thursday to accept its offer. It said in a statement Friday it was dropping its bid due to lack of response from its rival. "Jos. A. Bank continues to believe that a transaction could be in the best interest of the respective shareholders of the two companies," it said in its letter to Men's Wearhouse's CEO. This marks the second time this year Men's Wearhouse has rejected the idea of a sale of the chain. In June, it took the unusual step of firing George Zimmer, its founder, chief spokesman and largest individual shareholder, saying that Zimmer was pushing the company's board toward an ill-advised sale to a private equity firm. Zimmer, who holds a 3.7% stake, responded that the company's board was ignoring his "growing concerns" about the direction of the company. The company fired back, depicting Zimmer as a power-hungry egomaniac who wanted to sell the company. Zimmer, who founded the company in 1973, had also been the company's sole pitchman, with commercials featuring him promising "You're going to like the way you look, I guarantee it." His firing prompted some initial customer backlash on Facebook. But investors proved more forgiving, taking shares higher until a disappointing sales and earnings report in September sent shares tumbling once again. The Jos. A. Bank bid came a week after that earnings report.